This is a sponsored post. All opinions about how to get your deck ready for spring are 100% my own. Sometimes small branches, leaves, and other outside debris can get lodged between the planks and under the joints. Do a quick inspection of your deck, and use a small putty knife or another suitable tool to loosen and remove any lodged debris before spraying. While you are clearing out debris, make sure to check any joists or support members. You may find that potentially rotting debris is sitting on top of support members between planks and other exposed areas. Removing this collected material before it can start to rot or mildew goes a long ways towards extending the life of your favorite deck. You may find that your trees and/or plants have grown since last year, and are now crowding your deck. Take this time to do any needed trimming before cleaning the deck. Not only will this avoid having the mess of trimming, but it will also make it easier to get in any tough and crowded spots as you clean. Now that you have got the debris clear and the bushes trimmed, protect the remaining landscape from damage. One of the best ways to do this is to gently wet them and cover them with plastic sheeting or a handy drop cloth. Next, you will want to remove any material you can from the deck before cleaning. The best way to do this is to sweep the deck using a quality push broom. You can also use a regular household broom, but it might take a little longer to get the job done. Another alternative is to use forced air, either from an air compressor or a leaf blower, to blow dirt and dust off of the deck. This also has the advantage of being able to get in many cracks and crevices. Be careful where you point the exhaust, though, since you don’t want anything damaged from flying debris. 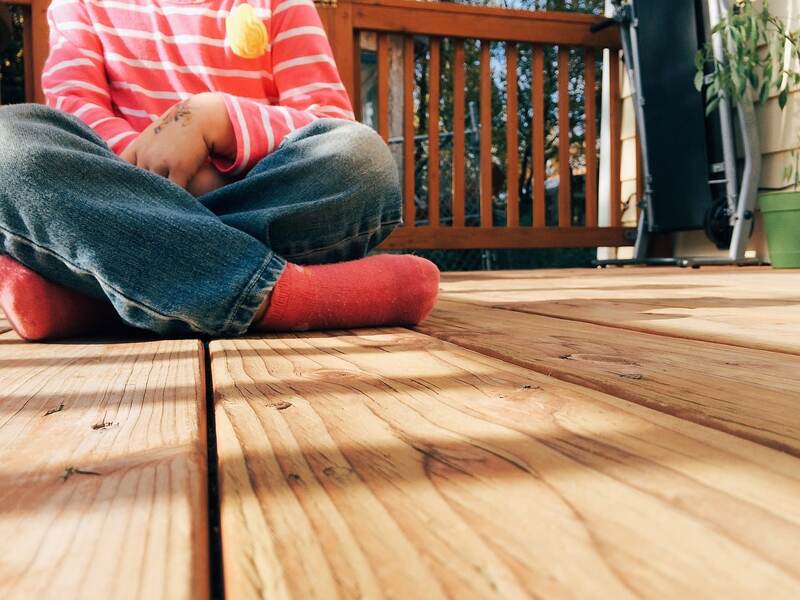 You’ll want to make sure that you choose the correct cleaner for your deck type. Doing so will allow you to do the best job without causing any undue damage in the process. Wood – Use a standard, commercially available deck cleaner. Follow the directions on the label, but keep in mind that some products require you to wet the deck first. Composite – If you have a quality composite deck, such as that from Decks & Docks Lumber Company, you’ll want to find a cleaner that is designed to work with that decking type. Many times these products will also clean any collected grease and detergents. Vinyl – Caring for a vinyl deck is probably the easiest of the choices. You’ll only need a mild soap and warm water to properly clean a vinyl deck. But even the mildest of soaps can be hazardous to plants and grass, so be careful with the product and any runoff. Now it is time to clean the deck. You’ll want to follow the directions on your cleaning product, but there are a few things to keep in mind. For example, you should never use a pressure washer on composite decking material. The forced water can cause the material to separate, damaging the decking and potentially voiding any decking warranty. Once you have your deck nice and clean, it could be a great opportunity to apply a good sealer to it. There are many products on the market for doing this, and select one appropriate for your decking type. Just be sure and let everything dry thoroughly before applying the sealer. You may want to wait a few days in between cleaning and sealing the deck just to be sure.